I hate to start out another Friday post with negativity, but this has been another awful week. I've decided that I'm over March and ready to move on to April. New months always feel like a fresh start for me, and April means that it's also a new quarter. It's also my marathon race month! So, I'm ready for today to be over because it will be the weekend and I can forget about having a horrible month. Let's cheer up a bit to talk about the things that did make me happy this week! For some reason I've been going through a big Spanish music kick lately. I've been working on translating our app to Spanish for work, so I think it's taking over my whole life! I really like this song because I love pretty much everything Shakira comes out with, and it also reminds me of summer between my sophomore and junior year of college. I had an internship in Cleveland and became really close friends with the other interns, and every week we would go to a salsa club to learn how to dance! My favorite style was the bachata (mostly because it was the easiest and slowest) so this song makes me miss dancing. Trust me, I didn't look ANYTHING like Shakira when I did it, but it was always so much fun! I haven't actually listened to this podcast yet, but I know everyone's already talking about it! I've been subscribed and patiently waiting for the episodes to come out for a few weeks now and I can't wait to listen. I'm waiting to binge listen to this during my marathon...I'm sure it will help the miles FLY by! Let me know what you think of it in the comments (but no spoilers plz). The last time that we took Selma to the vet for her check-up, our doctor noticed that she was having a little bit of swelling in one of her legs. She's almost six years old, so the vet suggested that we start giving her some Glucosamine to help out her joints. I found this brand at the pet store and so far it's worked out great! Selma loves the taste and it's like a little treat to her. She seems to be running much better and doesn't seem to have any more soreness. If you're also looking for some vitamins to help out your dog's joints I would look into these! Normani and Val - Great pair and she's a fantastic dancer. Definitely one to watch. Nancy and Artem - Really sweet and graceful dancer. I also appreciate the fact that she's kind of awkward on camera which is more relatable than the always-perfect celebrities on this show. Heather and Maks - More awkward than I expected. I hope she brings out more of her personality! David and Lindsay - Love him! So happy and sweet, and I loved the baseball players calling in! Erika and Gleb - Never watched her on Real Housewives and I'm not really a fan from what I've seen. My sister really likes her though so maybe she'll grow on me. Rashad and Emma - I knew he would be good and he definitely didn't disappoint. In the finals for sure. Mr. T and Kym - Eh. Seems like a great guy but won't be lasting long. Simone and Sasha - Pretty much what I expected- incredible! Who else has been watching the giraffe cam at the Animal Adventures Park in New York?! Dan and I have been glued to it for weeks, waiting for April to give birth. It's so cool to learn more about giraffes and to see how April and the zoo keepers interact. I can't wait to see the little cutie...hopefully in the next few days! Who is watching DWTS? Thoughts? It feels so good to finish a full week of training again. The weather was also perfect all week (is spring finally going to stick around?) and it felt amazing to run outside in SHORTS. I'm happy to be running again and for the most part this was a fantastic week. I did have a little setback that I'll talk about, and is the reason for the title today! Only four more weeks to go until race day, and each day I'm getting more and more of my confidence back. I'm using this entire training cycle as a lesson on what (not) to do and learning from it. I know I haven't even run this race yet, but I'm already excited to use what I learned to improve and crush some PR's this year. I'm getting ahead of myself, so let's just talk about training this week! I didn't really want to run for a third day in a row, so I decided to head out with Selma for a walk around North Park. She's always up for some exercise so we had a great time! The weather was also great, and we fit in a few sections of running (maybe 1 mile total). I was so excited for this run because I finally got to run in the morning again! The weather was perfect and I felt fantastic. I went for an easy run on one of my favorite routes, and it felt like I was finally back to normal. To be honest, I was really nervous about this workout. It was my first speed workout in a few weeks, and I wasn't sure how my body would handle it. My plan was 5 miles with the middle 3 at marathon race pace (9:00 per mile). I set out at an easy pace and instantly felt relaxed and happy to be out! I saw my time was 9:09 for the first "warmup" mile and decided to use this run as a time trial for the 3 miles, and see what my comfortable hard/tempo pace would be. My splits ended up being 8:31, 8:19 and 8:13. I felt like I could have run forever, and it made me SO happy! Saturday was Dan's birthday, so we got to do whatever he wanted for the day! I started out waking up early and getting in a quick 5 mile run at the park (stopping at the Boat House to cheer on some friends running Just a Short Race!). After I got home, we headed out to brunch at Casbah, where we had a fantastic meal. Then, we headed back to the park to go for a hike with Selma! It was so beautiful out and the park was packed, so I was happy to be on the more quiet trails. Selma had a blast and it was great to spend some quality time outside. When we got back home, we spent the night outside drinking wine and having some appetizers. It was pretty much a perfect day and the best way to celebrate his birthday. My plan for today was to do 15 miles. Started out feeling great on a sunny and warm morning. 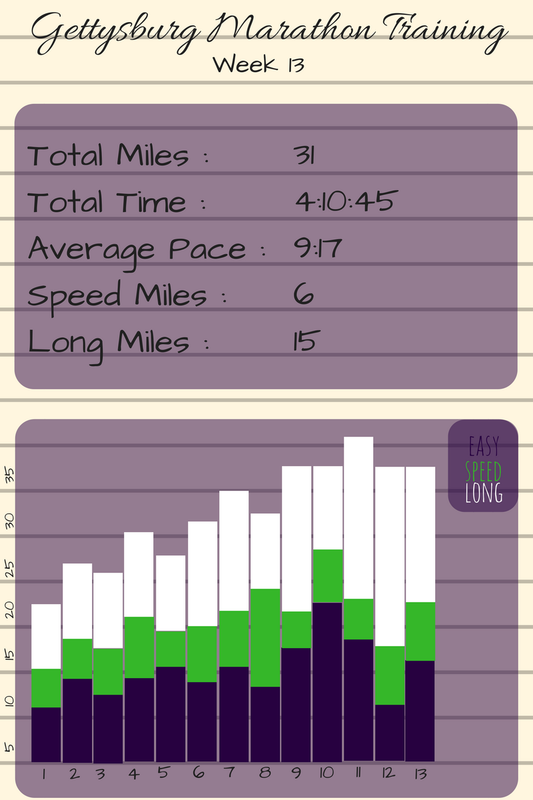 My pace was fantastic and I barely felt like I was working, plus my fueling was on point. Right around 10.5 miles I started to feel my shoulder get a little sore, so I decided to play it safe and cut my run a little short and not risk getting re-injured. I know that my fitness is there and I would rather show up on race day a little under-trained than not being able to run at all. Back to physical therapy! Overall I was happy with this week. Not everything went to plan, but for the most part I feel back to myself. I tried easing back into training and trying to not push myself too much. It's definitely a tough balancing act, but I'm working on it! Oh man, am I happy that it's FRIDAY. This has been a week. It seemed like every day was filled with minor annoyances that wouldn't normally bother me (broken down bus, broken elevator which meant I had to run up 27 flights of stairs to make it to a meeting, week long training, stuck in tech support for 2 hours for an Macbook upgrade, etc etc) but when it happened one after another it started to get to me! Luckily, I had a lot of social time on my calendar and opted for an amazing pie (which I'll talk about below) for dinner on a particularly bad day, so all is right in the world. This weekend is Dan's birthday and we have lots of fun plans! I'm looking forward to spending some quality time with him and hoping to spend lots of time outside in the warm weather. I hope you all have great weeks as well! This is not a new song, and it's one that I've been listening to for a few training cycles now. It's probably my favorite running song, because it has a fantastic beat that steadily gets faster as the song goes on, and it has a great reggae feel. It's a song I love to blast and just tear up the road! I've been a subscriber to the Runner's World magazine pretty much since I graduated college (before that I would always read them when my dad would get them in the mail) but just recently started listening to the podcast. I have no idea why I waited so long because it's probably my favorite one! I especially like the newer episodes because it follows the editor in chief on his journey to finally BQ, using the same trainers and doctors that are working with athletes trying to break 2 hours in the marathon. The most recent episode really got to me, because David is dealing with injuries of his own while training for a spring marathon. The advice and words of wisdom that he gets really helped me as well, and after listening to the episode I had the best run in at least 3 weeks. As I mentioned above, I was having a really awful day and decided to have one of those "I'm an adult and can do what I want" meals. I checked at Trader Joe's for the most delicious sounding thing I could find, which turned out to be this Mudd Pie! The description was full of all of my favorite flavors- "In our version of this Southern classic, we take a chocolate cookie-crumb crust, line it with ooey-gooey fudge, fill it with fudge-swirled coffee ice cream, and top it with a chocolate drizzle and a circle of fudge rosettes." Amazing, right? It tasted amazing, but since it has ice cream and I haven't been having dairy, it did make me feel a little sick. Other than that- worth it. This is going to be a boring answer today, because I've seriously watched 0 TV this week. Since I've been in training for work all week, I've had to catch up on my regular work in the evenings, and I'm getting back into running. Throw in some events with friends and I haven't had time to watch any new shows! I'm really looking forward to catching the season premier of Dancing With the Stars, so I'll be watching that this weekend. How many of you love this movie? It's part of my annual holiday video watching, and I love watching it any time I need a little pick-me-up. I was pretty excited to hear that the cast is filming a reunion special for NBC and can't wait to see where everyone ended up! It will definitely be a bit sad since one of my main actors in the movie (Alan Rickman) won't be in it, but the trailer gave me all the feels. Can't wait to watch it! Anyone else having an off week? What do you do during a bad day? Hi everyone! Training is almost over and there are only 5 weeks until race day. It's so hard to believe, and I almost skipped this update because I haven't been feeling that positive about training lately. But, it's a new week and I'm going to look forward (by first looking back). I've had 15 tough weeks of training so far, so I know that I can still reach my goal! I'm not going to let a little shoulder stop me! I'll be going through the past five weeks of training (the good and the bad) and talk about what I'll be working on for the final stretch of training. This is also the last that I want to talk about my injury, because even I'm getting sick of hearing me whine. Just a warning that I talk about it a lot in this post, but after this it's time to move on. Let's get into it! 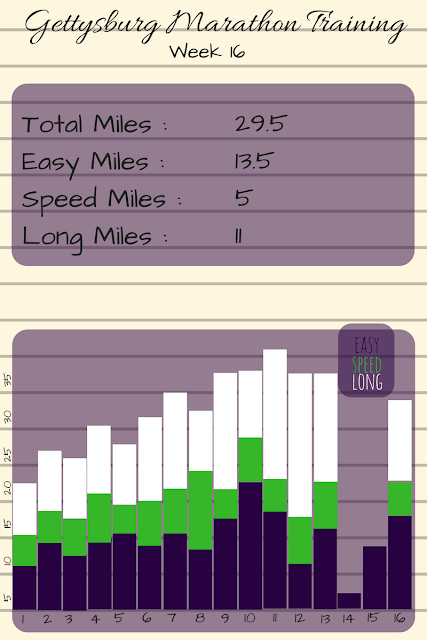 I started training by following Kara Goucher's Half Marathon Plan, which I really liked. After a few weeks, I switched over to a marathon training plan that's focused on breaking four hours. The only thing that I've modified is switching up the speed work. I'll incorporate some of the speed work in Kara's plan with the speed work in this plan and it's working out really well. I like how in the marathon training plan, there are a lot of workouts done at marathon race pace. I'm starting to get really comfortable running a lot of miles at this pace, and I know it'll help my confidence on race day. In this section of training I also finished my longest training run/race ever- 20 miles at the Spring Thaw! It was a great race and I was happy with how it went. Consistency. I've always known that my biggest problem with training was staying consistent. I would have good weeks and bad weeks, but my mileage and intensity fluctuated a lot. This time around, I made it my goal to stay consistent and not skip out on any workout. I did a great job of that and can definitely tell a difference. Making running in the morning (before work) a priority definitely helped out with this, so that I can't negotiate out of a run. Listening to my body. This is a hard one for me to do, but I learned that you really do have to listen to your body. I knew something was wrong with my shoulder, and luckily stopped myself from pushing too hard (which also meant missing a race and a fun trip to DC!). If I kept running, I could have caused a lot of damage to my shoulder which might have jeopardized my chances of making it to the marathon starting line at all! Sometimes it's best to take off a few weeks early, instead of pushing through and being forced to take off a few months. Physical Therapy. Going off of my last point- adding in physical therapy and low-impact cross training has really helped me stay focused and in shape during my time off. I was lucky to only be out for two weeks, but I think a lot of that had to do with being proactive and taking my recovery seriously! It definitely wasn't fun or glamorous to do daily exercises, and sometimes it really hurt, but in the end it was all worth it. Injury! I was out for two weeks and still don't really know what caused my rotator cuff injury. I had some people sending me advice or possible causes, and it seems most likely that it happened during yoga. I tried out a new video that was more focused on strength, and it involved a lot of positions low to the ground and in chaturanga. One cause of rotator cuff overuse is by having bad form in this. Jennifer sent me an article that offered a fix so that no one else gets this same problem- "Keep your body in a straight line, from shoulders to hips and knees, as you lower to the mat. If your upper body strength is sagging, drop to your knees on the way down and focus on hugging all of your muscles into your midline, engaging your core and thighs." Getting back my fitness. It's been harder than I anticipated to come back. Two weeks sounds like nothing, but my body feels like it's been on a break for a year. I'm working really hard to make up for lost time without overdoing it and causing a different type of injury! Cross training. Now, more than ever, I think that cross training is really important. I'm going to be backing off of yoga since (I think) that's what caused my injury. I want to add in other forms of cross training, and take advantage of the warmer weather by biking, hiking, and swimming. Comparison. I talked about that in this post, and it's still something I'm working on. I was doing a lot better with this, but now that I feel like I'm far behind everyone it's getting tough! I might have to get off of social media until my race so that I can focus on my own training and not compare myself to everyone else training for a race at the same time. loved this quote from Bethany! My next race is the Gettysburg Marathon! It's what I've been training for and I'm nervous and excited about race day. I'm going to focus on staying healthy and strong so that I can get to the starting line injury-free. I might have to re-think my goals (which I'll share right before the race), but for now I want to train as hard as possible! I'm happy to report that I got back to running this week! I took nearly two weeks off of running (and one full week after I stopped feeling any pain in my shoulder) just to be safe. Nothing would be worse to me than starting too early and being back where I started. Here's a look at my week, which includes some running miles (finally!). Only five weeks till race day! Finally pain free, so I got to exercise! It was so weird to go a week without working out at all. I felt so sluggish and lazy all week, so I was really happy to get my sweat on! I used the elliptical at the gym and finished 3 miles. I kept my bad arm on the arm rest and only "pumped" with my right arm. I did the exercises from my doctor, which has some strength moves and stretches. It takes about 15 minutes to finish and helps me feel stronger! I started to get bored with the elliptical, so I switched between the machine and the spinning bike. I made sure I wasn't bothering my arm at all, but my legs got a great workout! I stayed on the bike today and got in a great workout. I switched up the resistance and did some sprinting as well. The day I've been waiting for- getting back to running! I wore my special new pants and headed out for an easy 3 mile loop around my neighborhood. It started to rain lightly when I started, and with the temperature being in the 40's it was my favorite running weather. I was feeling super positive and felt like this was a sign that I came back to running at the right time...then it started to hail like CRAZY. It was stinging my face and I had to basically cover my face and try to sprint home. My shoulder felt great, but the weather was NOT on my side! I'm just going to pretend like that's not an omen and keep it as a good sign. I was back in my happy place at North Park and could not have asked for better weather. It was in the 30s and clear without much wind. I missed out on a lot of bad weather while I was injured, so I'll take this! I did an easy lap around the lake with an extra mile added on. I was surprised at my pace because it felt like I was dragging on this run. It definitely wasn't an easy run, and I have a long ways to go. Here's to hoping for an uneventful next 5 weeks! Ever get stuck in a crazy storm on a run? g up with Holly from HoHo Runs and Tricia from MissSippiPiddlin and also with Courtney at Eat Pray Run DC. Hi everyone! I hope you're all staying warm out there. The weather has been brutal this week, but luckily we didn't get as much snow as other areas on the east coast. For all of my California readers- enjoy the sunshine and warmth for me! I'm going to be sharing a few of my favorites for the week. I hope you all have a great (warm) weekend! I'm sure you're all well aware that Beauty and the Beast comes out this weekend, but even more exciting than the movie itself (for me at least) is hearing the soundtrack! I've always loved Disney music as a kid and listening to it still makes me happy, so hearing the new versions of old favorites has been really special. This medley might not be on the official soundtrack, but I love listening to Lindsey Stirling play so much that I had to include it. I've been loving watching and following along with the Indian Wells tennis tournament (which I talked about last week). There are so many matches going on that it's pretty much impossible to catch up, so I love to listen to the WTA podcast. I listen to this year-round, but it's particularly good whenever there's a larger tournament going on. The host interviews players, coaches, plays press conferences, and covers all of the upsets and important match-ups (note- this podcast only covers women's tennis, but No Challenges Remaining is my favorite podcast that covers the men's and women's game!). It's a great way to feel connected to the tournament and players without devoting all of my spare time glued to the TV! Last week, I was feeling down about my injury (which, by the way, has been feeling MUCH better and I'm going to try to run this weekend! Fingers crossed) and decided to do some retail therapy to cheer myself up, using some of the money I saved during marathon training. I ended up buying a new pair of speed tights from Lululemon in the most cheerful, happy print. There was only one size left (which just happened to be mine), and as soon as I checked out it went out of stock, so I'm telling myself they were meant for me. They made me happy and I can't wait to wear them out on a run. 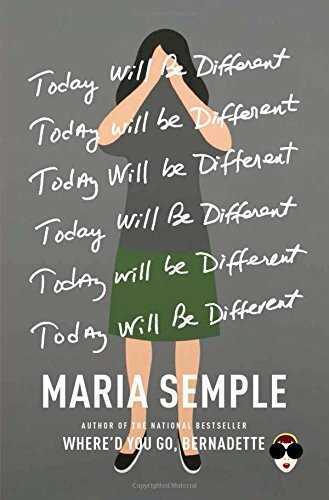 The series follows a woman who lives in Seattle and becomes involved with a free-spirited man who inspires her to make an "apocalyst", a list of things to do before the world ends—which he claims will be in eight months and twelve days. With the help of her friends, they try to find out if he can be taken seriously while completing the bucket list. It's such a cute and fun show that's easy to get into. If you're looking for a new show to watch, check this one out! One of my favorite parts of my job is that I get to find out about cool new apps and get to play around with them as research. One app that I learned about last week is called 1Q, which pays you to answer survey questions for companies. The questions are really simple (an example is "How many times have you been to Costco in the past month?") and you get paid 50 cents per question, which is automatically paid to your Paypal account! I haven't made a ton of money from it, but it's pretty much free money so I'll take it. What's your favorite store for some retail therapy? I have been reading so much lately, and wanted to share my recent reads with you all today. I hope you find a few new books to read, and please leave me your suggestions for what I should read next in the comments! 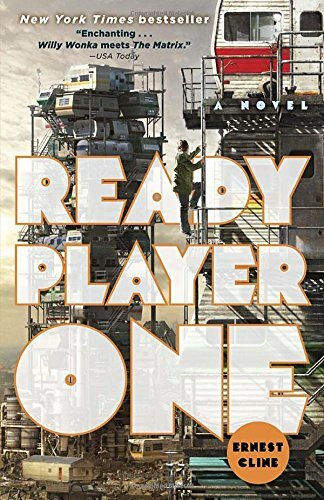 My Thoughts : I started out really liking this book and it went downhill really quickly. At first, it was exciting trying to figure out what the husband's secret was. It ended up being a really weird and not interesting twist, and I found myself not wanting to finish the book after that. 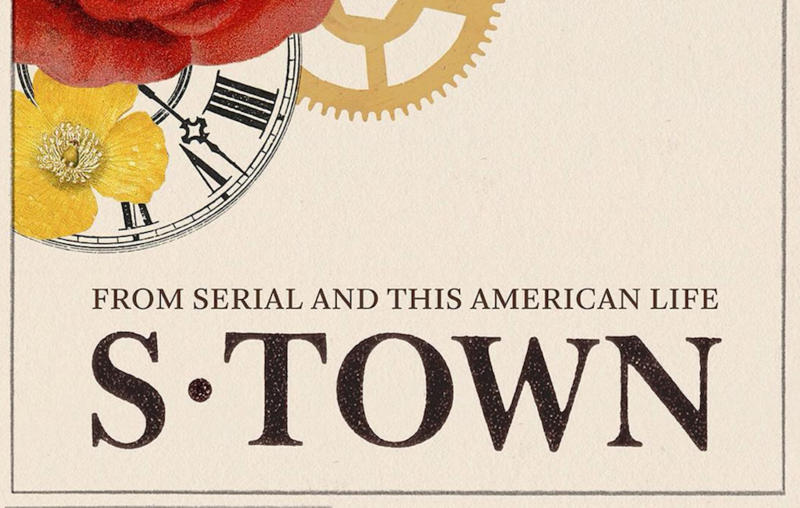 I won't give the twist away, but I wouldn't recommend you waste your time on this book. Read If... : you can only read half a story. I liked the first half! Anne and Marco Conti seem to have it all—a loving relationship, a wonderful home, and their beautiful baby, Cora. But one night when they are at a dinner party next door, a terrible crime is committed. Suspicion immediately focuses on the parents. But the truth is a much more complicated story. Inside the curtained house, an unsettling account of what actually happened unfolds. Detective Rasbach knows that the panicked couple is hiding something. Both Anne and Marco soon discover that the other is keeping secrets, secrets they've kept for years. 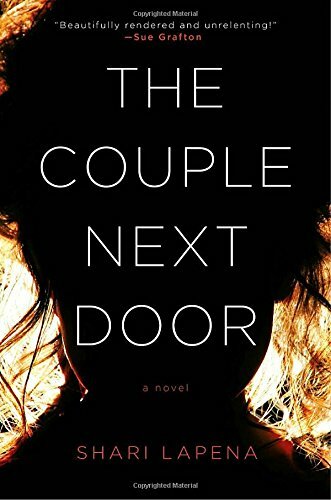 What follows is the nerve-racking unraveling of a family—a chilling tale of deception, duplicity, and unfaithfulness that will keep you breathless until the final shocking twist. My Thoughts : This had lots of twists and turns and kept me guessing the entire time. I couldn't put this down right from the beginning, and kept my interest the entire time. There were a few loose ends by the end of the book and I was confused at times, but overall this was a great read. My Thoughts : This seriously has got to be one of my favorite books of all time. 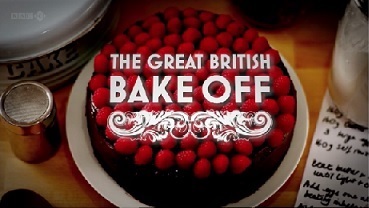 I absolutely loved it...It's so interesting and exciting! 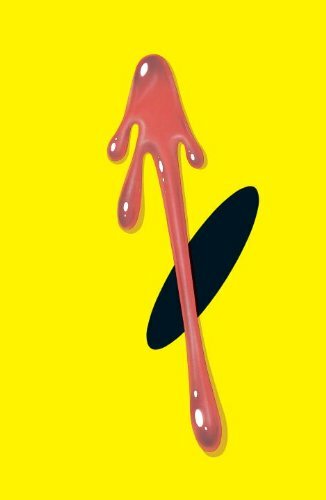 A movie is being created based on the book, and I can not wait for it to come out. Considered the greatest graphic novel in the history of the medium, the Hugo Award-winning story chronicles the fall from grace of a group of super-heroes plagued by all-too-human failings. Along the way, the concept of the super-hero is dissected as the heroes are stalked by an unknown assassin. My Thoughts : This was my first graphic novel that I've ever read, and it was kind of hard to follow and get into. I read it as part of my 30x30 challenge, but it wasn't a favorite for me. My Thoughts : This is also one of my favorite books that I've ever read. I love reading autobiographies and watching documentaries, particularly about athletes. This one is written by Andre Agassi and followed his life from the first time he hit a tennis ball until he retired. 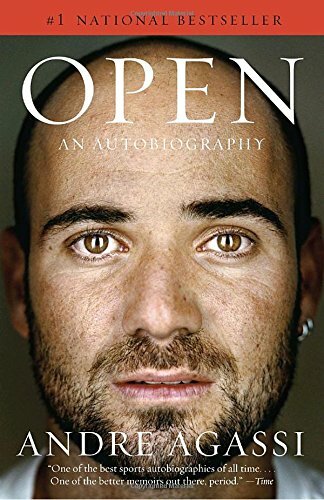 It's such an interesting story, even if you don't like tennis, and Agassi (or his ghost writer if he had one) is a fantastic author. The book is hilarious, heart breaking, fast-paced, exciting, and an easy read. Read If... : You like reading (auto)biographies, enjoy sports stories, like tennis, or want to read an inspiring story. What's your favorite autobiography of all time? note- post contains affiliate links to Amazon. Thank you for your support! Hi everyone! Today's weekly update is going to be a bit different because there wasn't much running happening. In case you missed it, I've been having pain in my shoulder for about a week, and at my annual check-up my doctor told me that I had a rotator cuff injury and I had to stop running before it got worse. I went on one run early in the week (before my appointment) just to see how my arm was feeling, and stopped after the pain got too bad. After that, I stopped running for the rest of the week and started doing some physical therapy that my doctor gave me. There are a lot of stretches and strengthening exercises that seem to be helping! I also got a sling to help isolate my arm in a comfortable position, and have been taking some acetaminophen for pain and to cut back on the swelling. I'm not going to lie and say I'm not disappointed that I had to miss the Rock n' Roll half marathon and a week of training. I had a pity party for myself after my doctor told me the news and I knew I had to stop training. I put in so much time and energy and effort in my training! I felt like I was finally hitting my stride (pun intended) and was really going to crush my goals. Then to find out I have a stupid arm injury and have no idea how it happened..it was really frustrating. I vented to a few people who understood my frustration then told me they still believe in me. Sometimes you just have to let yourself feel down for a bit, then get over it. I knew that if I was just angry about my arm it wouldn't help at all (and would probably make me miserable to be around which isn't fair to Dan), so I tried to look on the bright side a bit. I still have 6 weeks of training to go, I got to relax all weekend and save money since I wasn't traveling, and got to catch up on all of my favorite shows. Plus, the worst thing that will happen is missing the marathon, or being able to run it but feeling under-trained. To recap- this week I ran 2 miles, watched way too much TV, and did a bunch of shoulder physical therapy. I'll be fine, but I'm a little disappointed this happened. I also have a great support system (including all of you..thank you so much for your texts and sweet messages). Hopefully I'll have better news to report next week! Who raced this weekend? How did it go? Hi everyone! This is a weekend that I've been looking forward to for a while, because it's Rock n Roll DC week! Unfortunately I won't be able to run (my doctor said I have a rotator cuff injury and have to rest) but I'm still looking forward to cheering on everyone who is running. Let me know if you'll be there and I'll make sure to look out for you during the race! I decided to switch up my Top Five Friday post and start having categories. 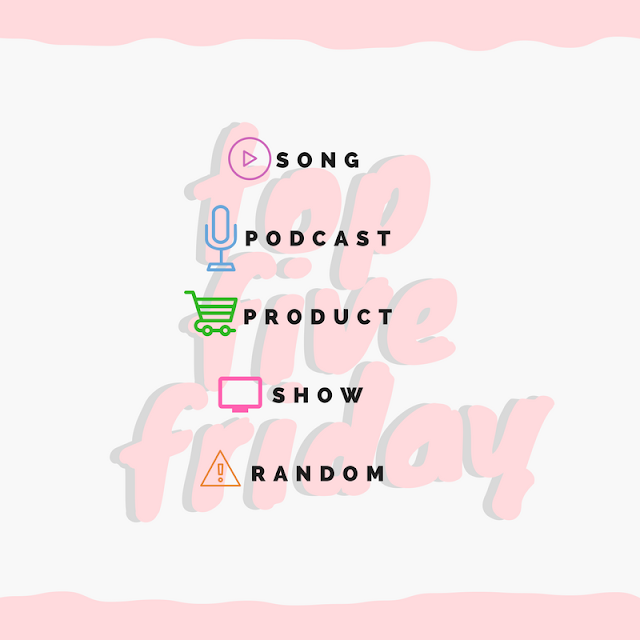 Some weeks it's really hard for me to come up with five favorites, so I decided to pick out a favorite in the following categories- songs, podcasts, products, shows, and randoms. Now you can know exactly what I've been loving each week and it'll be easier for me to track! Let me know what you think, and be sure to share your favorites in the comments. Have a great weekend! This is the best song to listen to during a hard workout. The lyrics are really motivating, and it has a great, steady beat. I'm a huge fan of Imagine Dragons and they killed it with this song. I love Ali's blog, and I think I love her podcast even more. She interviews interesting people- from her husband (and CEO of BOLD Worldwide) to local marketing directors of Strava. Her goal is to make the listener laugh and occasionally cry, and she hits that balance perfectly. 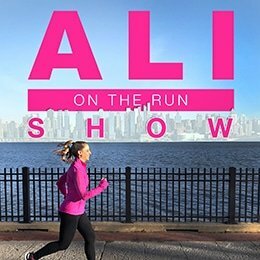 This is a perfect podcast to listen to on a run (I always say I'm listening to Ali on MY run! So funny). This has been my best friend all week. I've been icing my shoulder like crazy and this bag makes it really comfortable and easy! It never leaks or makes a mess, plus you don't need to wrap anything around it before applying it to your skin. If you don't have an ice bag I would suggest this one! It's that time again- another big tennis tournament! Besides the four Grand Slams, this is the highest level of tennis competition. Pretty much all of the top players come to play and it's so exciting to follow along. There are a lot of great matchups that I'm looking forward to, but the biggest story line is the quarter of the draw which features a ton of heavy weights- Federer, Nadal, Djokovic, Del Potro, Zverev, and Kyrgios. Those are all of my favorite players, and I CAN'T WAIT to see them battle it out. 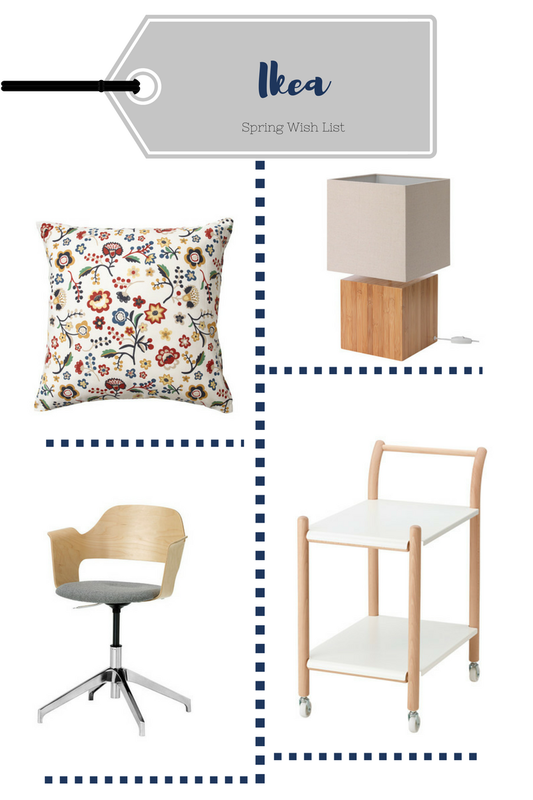 It's been quite a while since I've shared a wish list on my blog, so I thought it would be fun to share one today. Spring is right around the corner, and I've been seeing so many cute products at all of my favorite stores. I'm usually a pretty neutral person, but I'm really liking the fun patterns and bright colors I'm seeing around. 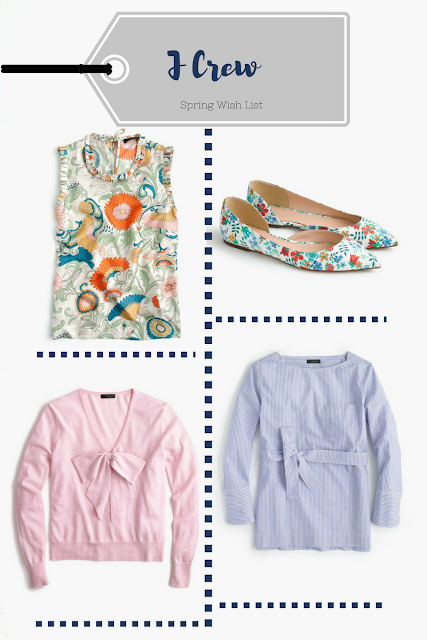 I'll be going through my favorite springy items at a few of my favorite stores- J Crew (Factory and regular), Ikea, and Target. I hope you enjoy my picks, most of which are on sale now! 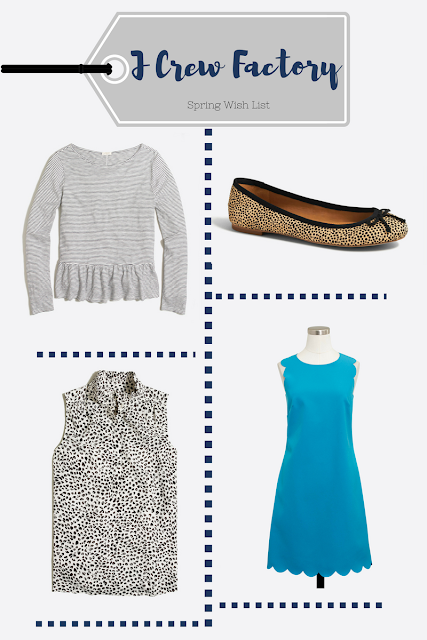 Let me know what you're loving for spring in the comments! I just love the style of this! I'm a huge fan of striped tops, and think this would be so flattering. Such a fun pattern, and I love the ruffle trim. I would wear this under a blazer for work, then take it off for drinks after. This would be perfect for those chilly spring days. I love the simple cut with a huge bow. Since I wear mostly black and grey on a daily basis, I like having fun shoes to add some interest to my outfits. I love the print on these. To be honest, I've been lusting after this dress for a few years now. I love to wear shifts to work, and this one is really adorable with the scallop edges. This looks so comfortable, but is more chic and interesting than a basic t-shirt. Similar cami to the one from JCrew, for a lot cheaper! I love the collar of this one. Another fun pair of flats. I've been looking for the perfect pair of cheetah-print flats and these might be it. How amazing is this print? As you can tell I'm really into bright florals this spring! I really want to get a little bar cart and I love the size and style of this one. I also need to get a desk chair! I'm using a dining room chair now, and I think this one would be perfect for my office. I love the Scandi style and basic colors. Interesting shape with some natural wood- what's not to love? How cool is this chair?! 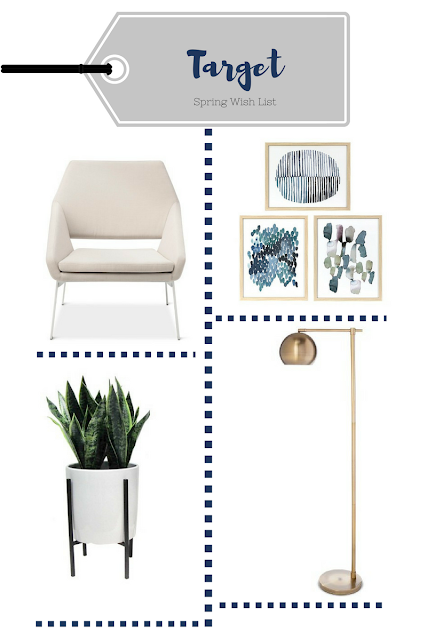 Target is really stepping up their game with interesting shapes and amazing furniture. I love brass accents, and think this would look great in any room. I can't keep any plants alive, so I've been relying on fake plants to green up my house. I love the look of this one, and the planter is great and neutral as well. I want to start adding art work around my house, and I really like how these three look like they're meant to go together, but can also stand on their own. What kind of patterns are you drawn to? Hi everyone! On today's Tasty Tuesday post, I'm going to be sharing a review of a few different kinds of veggie burgers. While I don't eat these all the time, they're a fun and easy meal to eat on a vegan or vegetarian diet. Or, if you're an omnivore and want to sneak in some extra veggies, these are a great and fun way to do that! There are so many brands out there at a variety of price points, so I wanted to break down a few that I've tried out. I have a bunch more that I want to review, so I'm thinking there will be a part two on this topic! I didn't want to overwhelm everyone with this post :) I'm also thinking it would be fun to review some Pinterest veggie burger recipes as well as restaurant versions. What do you think? Let's get started on the reviews! Taste - 4/10. Tastes very "green"...like a green juice that you know is healthy so you drink it, but don't really enjoy it. This is the only one Dan wouldn't finish and told me to never repurchase. Texture - 3/10. It had big chunks throughout, which got a bit hard in the oven. It was nice to see that the burger was actually made with veggies, but I prefer mine blended better. Would I repurchase? - No. Even though it's cheap, it didn't taste very good at all! Taste - 10/10. Tastes just like a burger. It had a crumbly, meaty taste that reminds me of a real beef burger. Texture - 8/10. It didn't have any chunks in it and had the same texture as ground beef. It even smelled like beef somehow! Would I repurchase? - Occasionally. It's more of a splurge, and the ingredients aren't natural. But, I think it would be great after a long run since it's so high in protein. If I ever craved a real burger, I would reach for this. I also love the company's mission of changing the world and making good-tasting meat substitutes. The owner of the company was just featured on How I Built This if you're interested in learning more! Taste - 10/10. Doesn't taste like a meat burger, but is really interesting. Sweet taste with a lot of other interesting seasonings and vegetables. Texture - 7/10. Kind of spongey and doughy. I wish it could get more crispy. Also has some chunks in it from the vegetables, but it isn't off-putting. Would I repurchase? - Yes! I have before and will keep buying these. Can't beat the taste or price. I also like to add this burger, chopped up, into a salad or mixed into pasta for a quick meal! Plus, I love that the ingredient list is mostly all whole, healthy foods instead of a bunch of chemicals. Taste - 8/10. This is really similar to the other TJ's burger, but has more Indian spices and ingredients. I prefer the Thai one over this, but Dan prefers this one! It also packs some punch with all of the spices, so if you don't like spicy foods I would stay away. Texture - 8/10. Same as the other, with a few more big chunks of vegetables. It isn't quite as spongey though, so I gave it an extra point. I think this is mostly because the base seems to be pieces of potatoes, which doesn't sound that great but actually makes a wonderful patty base! Would I repurchase? - Yes! For the same reasons as the other...it's cheap and makes for a simple and really quick meal. I like to keep a box of these in my fridge at all times just in case I don't have to cook a real dinner. What are your favorite veggie burgers? Are there any kinds you want me to try out next? What is your favorite recipe for veggie burgers?